We are the only specialist adult mental health music therapy charity in the UK. We use music to help people in the South West whose lives are seriously affected by mental illness. Alongside this we work with unpaid carers who are in need of support. Soundwell works in many key disadvantaged communities throughout North Somerset, Bath and NE Somerset, and Wiltshire, often working in rural areas where there is a distinct lack of accessible services. Our team work with participants delivering a range of services, using music and sound to promote positive mental health, well-being, change and recovery. We also aim to raise awareness of the benefits of music therapy for mental health service users with high support needs both locally, regionally and nationally. 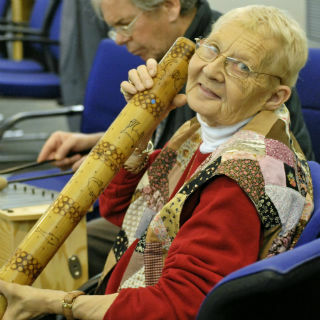 To preserve and protect mental health and assist in rehabilitating people experiencing emotional or mental distress (“the beneficiaries”) living in the South West of England and in Wiltshire and Bath and North East Somerset in particular, through the practice of music therapy. To advance the education of the public, and in particular service providers and the music therapy profession into the potential benefits of music therapy for people experiencing emotional or mental distress.